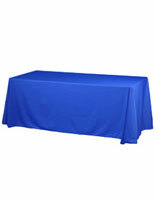 This Effective Table Skirt Gives Vendors, Retailers, and Exhibitors the Cutting Edge! 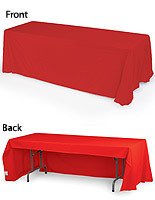 Stand Out at a Trade Show or Banquet with a Brilliantly-Colored Display! Buy This Premium Table Skirt at Discount Cost! 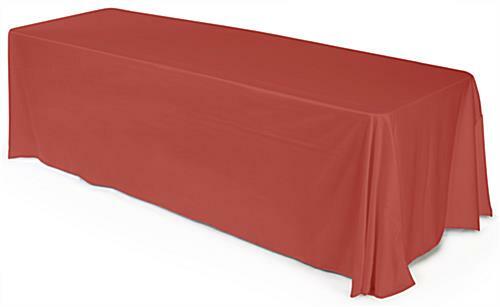 This cover, table skirt is made of red polyester fabric. The material has been certified fire retardant from an independent testing laboratory, and each includes a certificate stating this fact. 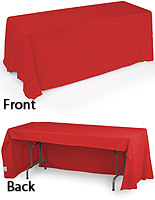 The table skirt is machine washable and dryable, which makes it easier to clean and take care of if it becomes dirty. 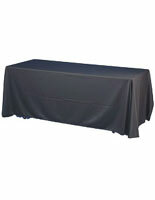 A throw, or cover, can be used to dress up tables that have blemishes, which enables a professional appearance. This table skirt is typically used at trade show events, retail stores, schools, and offices to help draw passersby to a display. 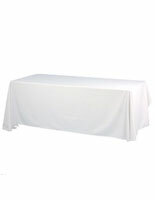 A tablecloth, table skirt is designed to be used with 8' x 30" x 30" tables, and measures a total of approximately 89 ft.2 When positioned at the center of a table, the cover will hang 2" off of the ground. 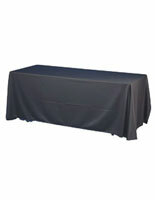 The table skirt features (4) rounded corners to assist with placement atop tables. 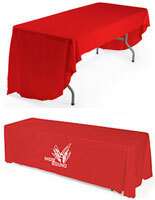 Users may further accent presentations by purchasing custom table runners that show business logos or offered brands. 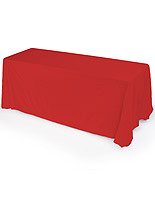 This red table throw, table skirt is made of a durable material to last for years to come. Ensure a lasting impression on visitors to your table!